Let's play a quick game. Pretend your job is to promote a new free-to-play, team-based PvP game about warring humans and vampires. It's set in your typical medieval-Europe styled world. There is violence and dark magicks. A new trailer arrives to inform viewers of both an upcoming open beta, and a free weekend that takes place this Thursday, 7 August. Got all that? Okay, what music do you pick to accompany the trailer? 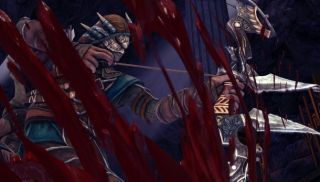 If, for some bizarre reason, you answered "dubstep", it's possible you're the person responsible for this Nosgoth teaser. The free weekend will take place on Steam, and run until 8am BST on Monday, 11 August. All participants will receive double-XP and an exclusive in-game badge.